The exhibition interweaves the most subjective and localized accounts of female lineage and transmission with broader historical narratives. Unfocusing from closed frames and grand narratives, the artist emphasizes threads of life stories and lines of intergenerational transmission, revealing unwritten histories as anti-totalizing forces that entangle and unravel through several knots. 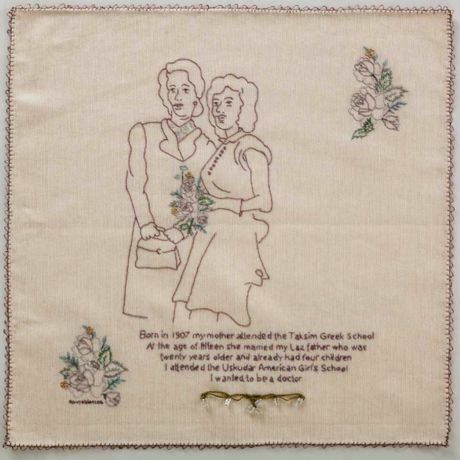 In line with Atakan’s previous work and research and by combining the Western tradition of samplers with elements from Turkish needlework, the exhibition ties autobiographical elements to wider historical shifts affecting the education of women in both Western and Turkish contexts of modernization. How do we draw the lines between our life stories, stitching together what we’ve inherited from the past and what we transmit to the future? The exhibition takes as its point of departure an invitation by Nancy Atakan to women in her family and circle of friends to collaborate by sharing memories and family photographs. The resulting needlework objects presented in the form of wrapped gifts in the exhibition attest to an ongoing process of exchange and collaboration, a community of lines beyond the exhibition’s time and space.